In an effort to get a little bit more inside the game, we are pleased to welcome Alen Dumonjic, and x’s and o’s football junkie who blogs for The Score on the intricacies of the game, into the blog fold. He’ll be providing an analysis on the Friday before each game from here on out. The New England Patriots kick off their regular season on Monday Night football against the Miami Dolphins and there are many interesting questions for the game. Some of the questions include what kind of defense will the Patriots unveil? Will it be primarily an even front or an odd front? Or will it be multiple? What about the Miami Dolphins offense? We know their defense is quality but the biggest questions are on offense, particularly the quarterback position, which is manned by Chad Henne. The Dolphins offensive philosophy is one that will be interesting to watch this season because some are predicting a lot more passing than previous years under head coach Tony Sparano because of newly hired Brian Daboll. Daboll was hired by the Dolphins as their offensive coordinator after two years with the Cleveland Browns. Daboll’s offense has been balanced in his two years as an offensive coordinator and don’t expect that to change much in Miami this season with the drafting of a running back high in the draft as well as paying Reggie Bush to join the team. Daboll will bring a philosophy that employs a more aggressive passing attack opposed to the conservative one that Dan Henning employed last season in Miami. There will also be more usage of screens as well as 3 and 5 step drops, opposed to the commonly called 7 step drops under Henning. Brian Daboll has a lot of pass concepts in his arsenal, and he uses a variety of them during the game so it can be difficult to narrow it down to just one, especially in the pre-season. There are a lot of 2 man combination concepts and a majority of the concepts that he has implemented in Miami can be traced back to his early days with the Patriots as a wide receivers coach. Below are some of the concepts that he learned in New England during his stay. Here are some of the concepts that can be seen throughout the pre-season of the Dolphins offense. The strengths of the Dolphins offense are the wide receivers. The group is led by wide receiver Brandon Marshall, who is one of the best in the league at his position because of his ability to make big plays after the catch, and he is accompanied by Davone Bess, who is a quick footed cookie-cutter route runner with dependable hands. The Dolphins also have wide receiver Brian Hartline, who is a student of the game and has proven to be a quality deep threat. These three players could prove to be a problem for the Patriots, who are welcoming back cornerback Leigh Bodden from injury as well as a new starting safety. The Patriots like to have a lot of coverage flexibility in the defensive backfield, as they play more than two dozen coverage variations a year, by mixing and matching coverage’s to create favorable match-ups for their players. 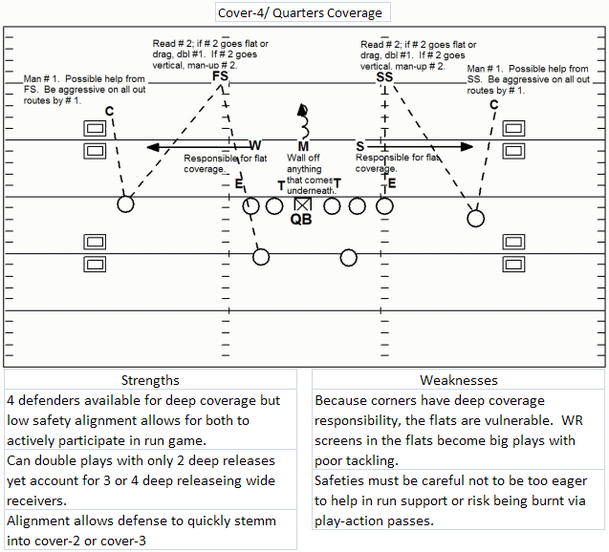 An example of a coverage that they could use is Quarters (also known as Cover 4), which they often pattern read out of as they did against Miami last season. Pattern reading is a tight zone coverage which eventually turns into man coverage after the routes of the pass catching threats are revealed. When pattern reading is implemented in Quarters, the cornerback is responsible for the #1 receiver unless there is a threat in the flats, which the cornerback would then pass off the #1 to the safety and drop down to cover the flat threat. The linebackers are also communicating constantly to determine who is going to be picking up crossing routes and any other receiving threats. What this coverage does for the Patriots is cut down the holes in the coverage while also bracketing the wide receivers. Bracketing is a form of double coverage, which can be done by having players inside and outside or on top and below of the pass catcher. An example of traditional Quarters coverage is below. Moreover, the weaknesses of the Miami Dolphins offense is their offensive line. Despite the significant amount of money poured into the trenches, the Dolphins still have had issues along it, particularly on the right side. The right side of the Dolphins offensive line features a new starting right tackle, Marc Colombo, and Vernon Carey at right guard, who played right tackle last season. This is a weakness of the Dolphins because of the lack of quickness off the line of scrimmage that these two starters possess. The lack of quickness of Carey and Colombo allows the Patriots defensive line to have an advantage because they would be quicker at getting to the point of attack, which consequently means that they are likely to have the leverage advantage. The Patriots have a lot of talent along the defensive line, which features new acquisitions Albert Haynesworth and Shaun Ellis to go along with nose tackle Vince Wilfork. Haynesworth and Ellis are both versatile players, having played the 3 and 5 techniques at times in their career with success, and could cause problems for the Dolphins right side. The Dolphins defense is the strength of the team and it’s led by defensive coordinator Mike Nolan. Nolan is one of the better coordinators in the league, and he runs a defense that can be simply described as “multiple”. Nolan bases his defense out of a 3-4 but will also use a lot of 4-3 rush concepts out of the 3-4 shell as well as four man fronts. The Dolphins like to mix gap principles along the defensive front, using 1 and 2 gap, much like the Patriots do. Furthermore, the strength is the defensive line. The defensive line is two players deep at the defensive end positions and features players that can play multiple positions, such as Tony McDaniel and Randy Starks. The defensive line also welcomes back second year defensive end Jared Odrick, who has a lot of potential and is expected to make significant contributions after missing nearly all of his rookie season. Paul Soliai and Kendall Langford are the key players on the line, as they are both very good at their positions. Langford, who often flies under the radar, is a quality run defender and can apply pressure on the quarterback while Soliai does a great job as a plugger at the nose tackle spot. A couple of weaknesses that the Dolphins have in their defense is their inability to defend the seam as well as match-up with slot receivers. The seam threats have been an issue for the Dolphins over the years, and it continued last season in when several tight ends had big games. The reason for the Dolphins issues covering the seam was a lack of quality cover linebacker. Recently released and retired linebacker Channing Crowder struggled in coverage and the Dolphins were lacking a nickel linebacker. Leader Karlos Dansby is one of the better coverage linebackers in the NFL, but the Dolphins lacked another cover linebacker next to Dansby on passing downs, which is why the GM Jeff Ireland brought in linebacker Kevin Burnett from the Chargers. Burnett, who had a career year, brings athleticism to the position and the ability to match tight ends in man coverage. This will be vital in the AFC East, which features Rob Gronkowski, Aaron Hernandez as well as Dustin Keller. The second weakness the Dolphins had last season and could continue to see an issue this upcoming season is the inability to cover slot receivers on a consistent basis. Nickel back Benny Sapp was traded to the Dolphins in 2010 in hopes of shoring up the position but had issues that hurt the Dolphins last season. This will be an important part of this game, and it is something that the Patriots may be able to take advantage of on Monday night. Monday night football will bring a lot of new things to the Patriots-Dolphins rivalry but it will also bring some familiarity because of new offensive coordinator Brian Daboll’s history with the Patriots. It will be interesting to see how the Patriots match-up with the Dolphins wide receivers as well as how they take advantage of the Dolphins weaknesses, such as the offensive line. If you want more on the Patriots defense, read my blog post here at The Score. Follow me on Twitter at @DraftableXnOs.